Our Rancho Cucamonga orthodontist has a fabulous reputation as an experienced specialist who has served the Rancho Cucamonga area for over 20 years, including celebrity clientele. 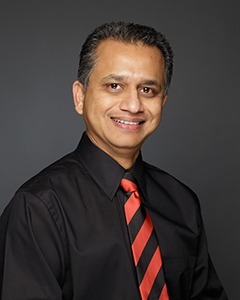 Dr. Patel uses several styles of corrective approaches, including Invisalign’s clear aligner trays, traditional braces (both mini metal and clear brackets), as well as the highly discreet Incognito braces, which are placed behind the teeth. He also specializes in the diagnosis and treatment of sleep apnea and often prescribes the use of an oral appliance known as SomnoMed. The success of this revolutionary device has been life-changing for many of his patients. Dr. Patel has a passion for giving back to the local community and enjoys hosting an annual FREE “Dentistry Day” for people who can’t afford quality dental treatment. In fact, his love for humanity runs deep in the family as well, as his wife is a pediatric doctor and one of his children is currently attending medical school. Are You Ready for YOUR Dazzling Smile from Our Rancho Cucamonga Orthodontist? Dr. Patel offers a complimentary Orthodontic Consultation so that you can explore our many different treatment options. Your FREE evaluation includes a complete examination, digital x-rays, and a consultation with Dr. Patel. Call 909.945.0024 or click here to request an appointment today. For a limited time, this free evaluation comes $1,000 off braces or Invisalign and 50% off in-house teeth whitening after your treatment is complete! Do You Think You Might Be Suffering from Sleep Apnea? Many people are surprised to learn that a dental specialist can help them with issues like snoring and sleeplessness. You may also not realize that a common sign of sleep apnea is teeth grinding. Take advantage of Dr. Patel’s extensive experience in diagnosing and treating sleep apnea disorders by scheduling our Sleep Apnea Examination – also free! This consultation includes an oral exam and the opportunity to discuss sleep-related breathing disorders and potential treatments with Dr. Patel. Call 909.945.0024 today! As one of the premier dental and orthodontic practices in Rancho Cucamonga, CA, our team at California Dental Care & Orthodontics also provides 5-star-rated dental and orthodontic care to patients from Alta Loma, Ontario, Upland, Claremont, Fontana & Rialto, CA.